Hi @billybelly – It’s difficult for us on the buddypress.org forums to provide concrete advice on a non-free product, because we don’t have access to test it. If you paid for the UX Builder project, then they ought to be the ones providing you with support. It’s a bit hard to tell what’s going on without being able to log in and see exactly what your users are seeing. 1. If you’ve got access (through the mysql command line tool, or through PHPMyAdmin, check the character set and collation https://makandracards.com/makandra/2531-show-the-character-set-and-the-collation-of-your-mysql-tables There may be something funny going on there. It’s not possible to use a regular BP profile field to keep track of data changes over time. BP doesn’t keep records of old profile field values – it only stores the most recent one. Be sure you’re looking at the View All tab. 1. Check the timestamps at Dashboard > Activity. Are they off as well? 2. Are in timezone UTC-5 (US Eastern)? Just so we have a better understanding of what’s going on. 3. You say the “server time” is “set correctly”. Can you say more about what this means? 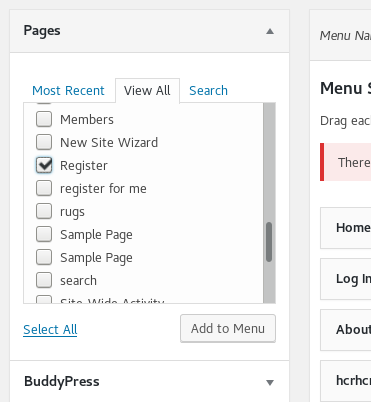 BuddyPress’s Register page is a special kind of page that cannot be edited via the Dashboard. That’s why it’s blank when you view it in the normal way. Repeat for mu-plugins and themes. For the record, I understand the frustration – piecing together many different plugins and tools, written by many different people, can sometimes have unpredictable results. Very odd. It sounds like, when you initially installed BP (or activated the Groups component), it didn’t properly install the database tables. I have not seen that happen before, but I’m glad that toggling the component resolved it. The email-change verification is meant as a security measure. If your BP credentials are stolen or lost, the only way you can get them back is with a Lost Password reset; the verification step means that an attacker can’t lock you out by changing your password and your password reset email. You could try using a different plugin for switching the login page. https://wordpress.org/plugins/search/login+page/ The one I’ve seen in use before is Theme My Login. Maybe it will work better with your setup.